Although he’d rather be preparing to play in this Sunday’s Super Bowl, Alejandro Villanueva now has a chance to get back to his studies at Carnegie Mellon University. Villanueva, a part-time MBA student at CMU’s Tepper School of Business, is not your average working professional seeking to advance his career with a master’s degree. At 6’9” and 320 pounds, he is the starting left tackle for the Pittsburgh Steelers, who fell one game short of advancing to the National Football League’s premier event. 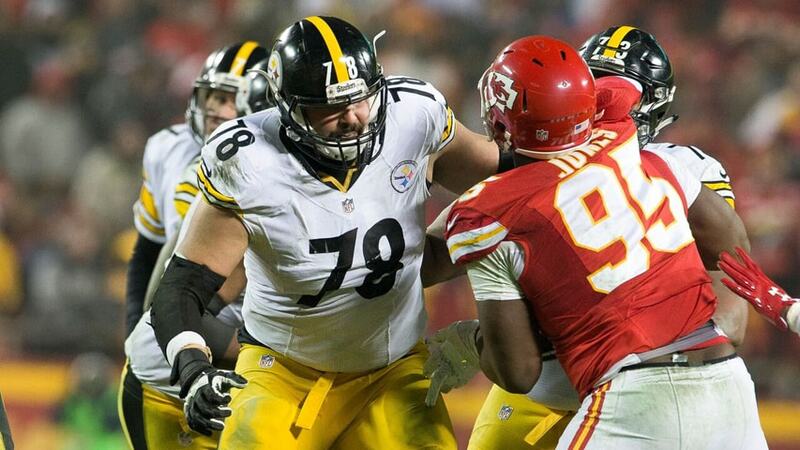 In his second season on the team, Villanueva has played a key role in the Steelers’ success as a cornerstone of the offensive line, protecting quarterback Ben Roethlisberger’s blind side. He ranked sixth in the NFL among offensive tackles by Pro Football Focus during the last seven weeks of the regular season. Villanueva enrolled in the Tepper School’s Part-Time, On-Campus MBA program in fall 2015 after joining the Steelers as a free agent the previous year. “I think grad school provides long-term stability, so my goal was to get to grad school and to get to a very good school. And so the opportunity to be here and play for the Steelers … has obviously been amazing,” Villanueva said during filming for a Tepper School video. “I found a really good place where I can expand my knowledge and learn all the things that interest me and get ready for my life after football,” he said. A popular 32-month option for working professionals, the Part-Time, On-Campus program was ranked second in the country by BusinessWeek. Classes are offered two evenings per week with a daytime option for electives. “The part-time program is very flexible, and it allows you to work with your teachers and the students in your class to get all of your assignments done,” Villanueva said. Courses emphasize analytics and leadership, areas that resonate well with the former U.S. Army captain. The son of a lieutenant commander in the Spanish Navy, Villanueva was born in Meridian, Miss., and attended high school in Belgium before being recruited by the United States Military Academy in West Point, New York. After graduating, Villanueva was highly decorated for his three tours in Afghanistan as an Army Ranger from 2010-2013. He earned several military awards, including the Bronze Star Medal and the Bronze Star Medal of Valor for heroism in combat. “He performed very well in Afghanistan. He was known as one of the best and most competent platoon leaders in the battalion,” said David Kitcho, a Tepper School MBA student who served with Villanueva. Kitcho called Villanueva an extremely special person. “You have to be [special] to play in the NFL … and at the same time go to a great business school like Tepper. You have to be gifted intellectually. And to do both is almost mind-boggling,” Kitcho said. Villanueva and Kitcho are among several veterans at the Tepper School. “There’s a solid veteran community here. I think the Tepper business school is organized in a very structured manner and that really helps the transition for a veteran,” Villanueva said. “I think the Tepper School is a great choice for veterans. The city of Pittsburgh is very welcoming, very affordable and offers things that veterans are very fond of, such as sports and the outdoors. It’s a great match. “The campus is beautiful. And the staff are giving the same effort you’d expect from high commanding officers in the military. It’s a neat opportunity and a very special place,” he said. Villanueva met the school’s namesake, David Tepper, prior to his first game with the Steelers. “Obviously, he’s a very impressive man. Attending his school is a privilege. I’d love to spend more time talking to him one day,” he said. Villanueva is one of two finalists for the sixth annual Salute to Service Award presented by the USAA. He and Atlanta Falcons Head Coach Dan Quinn were selected for their efforts to honor and support members of the military community. Villanueva participates in community events to honor military veterans, including “Heroes at Heinz Field,” in which veterans participate in football drills. He also visits patients at the VA hospitals in Pittsburgh. This year’s Salute to Service winner will be announced during the NFL Honors ceremony on Saturday, Feb. 4. Carnegie Mellon was recognized as a Top 10 Military Friendly School for 2017 by Victory Media for its practices in recruiting and supporting post-military students.